Hey, nobody likes doing dishes. A brutal fight broke out between employees at a Waffle House in Tennessee. And wouldn’t you know it? It’s gone viral. The video was filmed by diner Eric Cole who was just eating breakfast when two employees started screaming at each other. According to the store manager, the two women got into a fight over washing dishes at the Waffle House. One employee demanded another, who was off the clock, do the dishes. When she refused, the fight escalated. Waffle House has not publicly commented on the matter, other than to say that the manager successfully handled the situation immediately, though other reports suggest that both employees may have been fired. Police were called to the scene, but didn’t arrive until after the fight was over, and it’s unclear if any arrests were made. What makes this fight so fascinating is that it took at least 4 employees to break the fighters up, and one of the women reportedly had hair ripped out of her head. Makes you think that maybe less energy would be have been expended had someone just…done the dishes? But look, we can’t judge too much. Work at a restaurant can be stressful, which might be why this isn’t the first or the last employee Waffle House fight you’ll see. 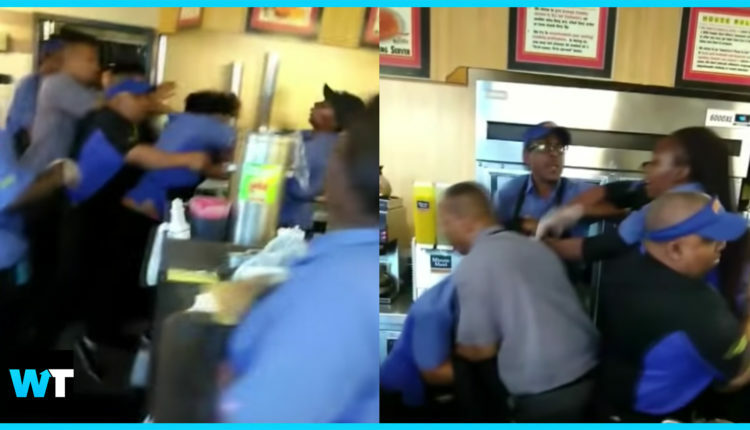 Believe it or not, this fight from a Waffle House in Alabama in 2017 was also over who was going to wash the dishes. And we’re not sure what happened to inspire this one but we do know they were ready to throw down. Now, if you think that these incidents are isolated to Waffle House, think again. And even at Taco Bell. The point is: the restaurant industry is very stressful so these fights are going to happen from time to time. We can only hope that most incidents will feature more employees working to break it up than customers filming it for social media. Before we end this video, we want to give a shout-out to all the great Waffle House employees out there who aren’t fighting over doing the dishes. We see you. Have you guys ever seen a fight in a restaurant? Let us know in the comments or on Twitter at @WhatsTrending.